Progress Reports, Reports on Progress, Oh My! After last weekend's BeGeistert took place the Coding Sprint and after the Coding Sprint we now have Adrien's report (although technically the sprint is still ongoing, seeing as Adrien's still in Dusseldorf). In the report Adrien covers the areas which received the attention of the present developers, namely the ARM port, FDT support, BMenu rework, Web+ Service Kit integration, Debugger improvements, S&T + ALE and also some old apps Adrien himself is working on. Adrien's report covers all those topics and provides a lot of information, some of which I was actually unaware, such as his work on Netsurf. On a personal note, I have to apologize to Alex for behaving like a giddy little school girl from the moment he told me of the work on Webpositive's backend and getting it to integrate into the Service Kit (imagine if we'd been talking about sheep...). As for the ARM port, it has received a lot of attention this week here at ICO with two posts back-to-back and here's more information about it, this time straight from the horse's (aka Ithamar) mouth. He wrote his ARM progress report on his work over these past few days (he was supposed to leave on Monday, then Tuesday and kept postponing it again and again. That of course meant more time at the Sprint which equals more coding time) and what's lacking and what the next steps should be. It would be awesome to see Haiku running on my tablet, heck, on any tablet of course. And on the Raspberry Pi too for example! So, if you're interested in the ARM port, dig in and start coding. If you're not, join in all the same and work on another part of Haiku! As someone else said some time ago: DEVELOPERS! DEVELOPERS! DEVELOPERS! The Snake-Like ARM of Haiku. That didn't take long now did it? If you've read yesterday piece (the one right below) I mentioned a goal Ithamar had before leaving the Coding Sprint, which was "to have Haiku boot all the way until it complains no boot device was found". Well, guess what? I just received a nice e-mail from Ithamar with a new screenshot. And a new kernel panic message. That message reads: "get_boot_partitions failed!" That's it! Goal reached! Ithamar again was helped by Rene and this time they also had the assistance of Adrien (Pulkomandy), so hats off to all three, amazing job guys, just awesome. I asked Ithamar what his plan now was and he said it's "to look at FDT (Flattened Device Tree) so we can make it easier to add support for other devices". Now, this was reached in under 4 days of work, imagine if we had more BeGeistert weekends and Coding Sprints. Imagine if I won the lottery and donated that £1m pounds to Haiku! The Long ARM of Haiku. Well well, what do we have here. If you've read my previous post, the report on this weekend's BeGeistert, you'll know Ithamar spent all weekend working (minus some smoking breaks and one or two meals) on the ARM port. Last night Rene sat next to him (I moved chairs or he'd have sat in my lap, he's sneaky that way) and the two started working around some bugs on the kernel. Ithamar, since early in the weekend, set himself a goal and although quite not there yet (hopefully he'll reach it before leaving the Coding Sprint), the progress has been been impressive, as I'm sure you'll agree. What you see below is a WORLD EXCLUSIVE (had to) of Haiku booting on ARM. 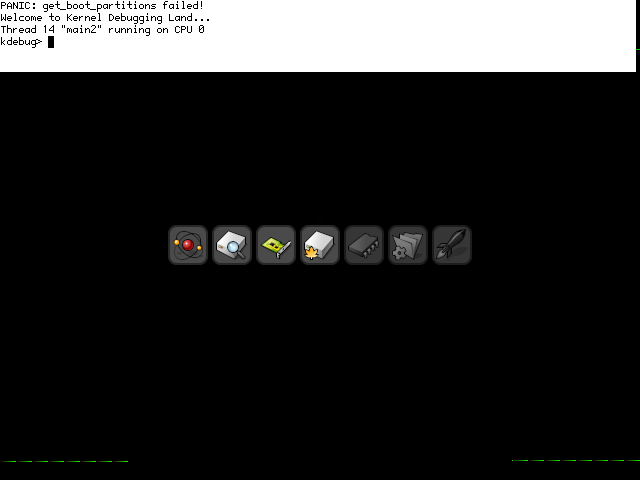 It's in QEMU and as you can see it panics and goes into KDL, but the icons are starting to light up! Now, the goal I mentioned? 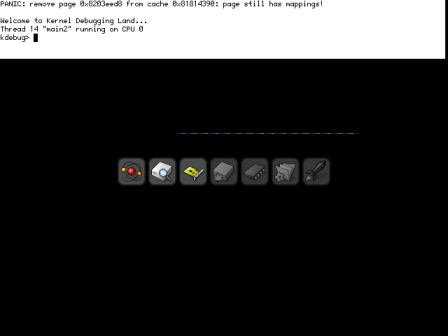 To have Haiku boot all the way until it complains no boot device was found (which is to be expected). Can Ithamar reach it? Knowing him, I'd say we have a pretty good chance of that happening. Awesome work. Wow, these past two days just flew by, I'm now back home, tired (not having much sleep does that to you) but having had a great time in Düsseldorf in the company of fellow Haiku'ers. The weather wasn't great, the internet access was even worse, but everyone had a good time and now it's time to sit back, relax and wait for the next one. Unless of course you're one of the 6 still there, now taking part of the Coding Sprint. After the break you'll find my report of what happened during BeGeistert 026, hope you enjoy it, I sure did! Read more: BeGeistert 026 Report. It's getting closer... if all goes according to plan, we'll see Haiku Alpha 4 available on October 15th! Just over a week away, so start prepping those CD-R or USB sticks for the installation. Update: So, as I'm sure you've noticed, October 15th came and went and no Alpha 4. Not everything went according to the plan it seems and as such, we'll have to wait a bit longer. Will it be before BeGeistert? Will it be at BeGeistert? Or will it be during/after the Coding Sprint which follows BeGeistert? And how many more times can I write BeGeistert in this update? Stay tuned... see you at BeGeistert! Update 2: A new release date has been set! 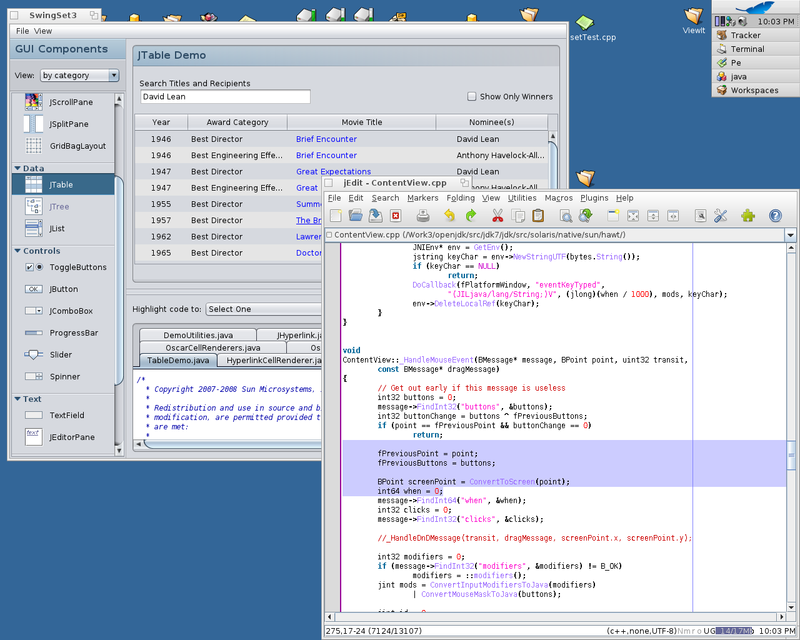 Kallisti5 has just sent an e-mail to the haiku-development mailing list with the announcement. The date is now November 12th. He's now working along with Ryan, sharing the role of release coordinator. This will also allow a final rush of bug squashing during the BeGeistert Coding Sprint, and that can only be good news. Mark your calendars (again)! Oh happy days! Haiku just announced that two new development contracts will soon(ish) be starting. Two contracts for two developers for two months each, awesome. Ingo and Oliver will soon start their new contracts (probably around the end of the year) and both will be working on package management, that will bring it way up to speed, no doubt about it. On a related note, Matt posted a new blog entry precisely about Haiku's package management, highlighting some key aspects of the upcoming Haiku system, a good read. Can't wait for the end of the two contracts to see the results of their hard work. As I said earlier, awesome. Another year, another birthday, and it's no different for Haiku. Today Haiku turns 11 and it's time to celebrate it, so crack open the champagne bottles and bring out the cakes (which are not a lie in this case). It's been a good year so far for Haiku, work done in development contracts, the GSoC are going very well and, if all goes according to plan, Alpha 4 shouldn't be a long wait. So raise your glasses and join me in a toast: to Haiku and to everyone involved with it, you all deserve it. Cheers! GSoC Midterms: It's a Pass! The good news are, all midterm reports have been posted online and (most importantly) all students passed their midterms. Bad news is... well, there's no bad news really, only the fact we want GSoC to be over quickly so we can check their final results. This year could be the year where Haiku finally sees all of its GSoC projects come to a successful end, after five attempts. From what I've been told (and from what you can see from their reports), all students have been making good progress, keeping within their own deadlines, etc. And better yet, not only two of the students have already been given commit access, Alex Smith (of the x64 port) and Hamish Morrison (of the openJDK port), but at least some are planning to stick around Haiku after GSoC and help the project move further along. So head over to Haiku's site and read their midterm reports, we're already looking forward to their final ones. Michael Lotz Returns to Haiku. As you are aware, a few months ago Michael had to take a step back from Haiku due to RealLifetm. The good news is, he's now back and back to coding as well. Matt published yesterday a news piece over at the Haiku website with this information, along with some... artistic improvisation (in the very large sense of the word, ahem...). And today, just a few minutes ago actually, Michael has published a new blog entry detailing the project he's currently working on and I must say, it's damn interesting: generating QR codes from KDL. QR codes have been used more and more for the past couple of years and nowadays you can find them almost everywhere, from app markets to advertisement (with people now including them in CVs as well). The idea is to simplify the process of capturing the KDL information displayed on the computer screen, without the need to, for example, writing it down by hand. Michael goes on to describe the limitations to this and the possible way to overcome such limitations, e.g. generating several QR codes instead of just one. As I mentioned above is damn interesting, so head over and read his full post. Welcome back Michael, it's great to have you in our midst again. As you are all aware, 2012's Google Summer of Code is well under way and in some cases, very well under way. The quarter term reports for 3 of the projects have been now posted over at the Haiku website: the OpenJDK port, the x86_64 port and the cpuidle project. Can't wait to read the missing quarter term reports and most of all, can't wait for all of the projects' final results. Great work everyone. Update 2: And the final report's in. Andreas posted this afternoon the quarter term report for his BFS Partition Resizer project. He has pretty much reached his goal of having inode-moving working and will now work on the rest of his plan. Check his progress right here.